After the cataclysm that devastated Ape City, Doctor Zaius, his family, Cornelius, and Marcus are tasked with the difficult and often treacherous responsibility of rebuilding civilization. But what terror lies beneath the ruins? 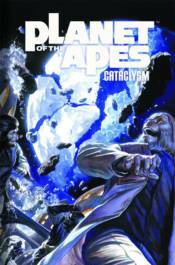 Ancient mysteries unfold and Ape City continues to crumble while Zaius' search for answers winds its way deeper into the unknown. Collecting issues 5�8 of the critically acclaimed series.